Via Instapundit, some plotting of data from the notoriously inaccurate exit polls. That aside, the data was summarized in to graphs that seem hardly ideal for the message they’re trying to get across. Man, look at that blue line dive! Now, I’m officially picking statistical nits with a statistics professor, but I really don’t get why he made his graphs this way. I mean, aren’t line graphs supposed to show change over time, where possible, not change over age? Bar graphs waste a lot of ink expressing the same information, and I’m not a general fan of them, but they do have a purpose. Where the lines in the above graph were useful for comparing the trends of one group across the years, this bar graph can show the difference in relation between groups over they years. It’s a subtle, borderline-pedantic difference, I think. 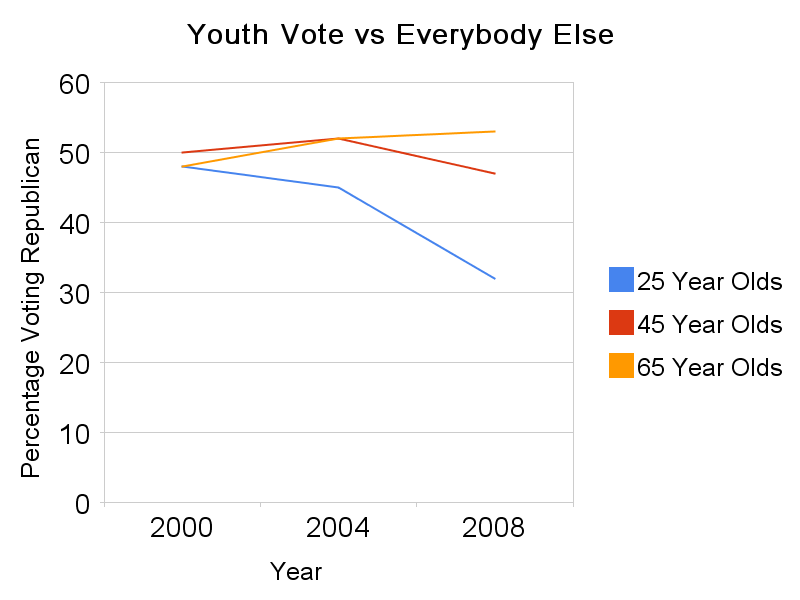 Where the first graph pretty clearly shows the decrease among the youth voters, the second graph more accurately shows the disparity between the youth vote and the rest of the vote. Both have interesting stories to tell, and, it seems to me, both present the information more clearly than the original. I have to say I prefer a college freshman’s plot to yours, Andrew. Although, you did hack it together at 3am after strolling around Grant Park. And drawing the y axis from 0 is a mistake which you didn’t make, too. I agree–his plot is better! Age on the x-axis is good, but time is even better. I should remake my plot with all his plot’s good features plus a few improvements (fixing the y-axis, removing the horizontal lines, and labeling the lines directly rather than with a color code). Also it would be good to use NES to take the lines back to earlier years. P.S. He also posts a bar graph, which, as he notes, is horrible. Today, I think I’ll borrow a leaf from Hazel’s playbook: let the music do the talking. Some pretty jaded words for this, my first Election Day. Except I imagine the actual easy difficulty version of the track is somewhat less interesting.